Data centers are feeling the pinch of uncontrolled internal growth and more demanding requirements – making it painfully obvious that there is a need for a more structured approach. It is now time to revisit data center design to make sure it is aligned with what the organization needs. It must be streamlined to reduce costs and respond quickly to changing and growing requirements. 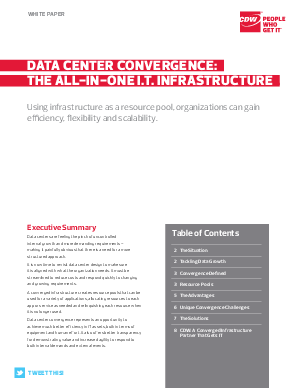 Data center convergence represents an opportunity to achieve much better efficiency in IT assets, both in terms of equipment and human effort. It also offers better transparency for demonstrating value and increased agility to respond to both internal demands and external events.